The Scottish preacher John McNeill liked to tell about an eagle that had been captured when it was quite young. The farmer who snared the bird put a restraint on it so it couldn't fly, and then he turned it loose to roam in the barnyard. It wasn't long till the eagle began to act like the chickens, scratching and pecking at the ground. This bird that once soared high in the heavens seemed satisfied to live the barnyard life of the lowly hen. One day the farmer was visited by a shepherd who came down from the mountains where the eagles lived. 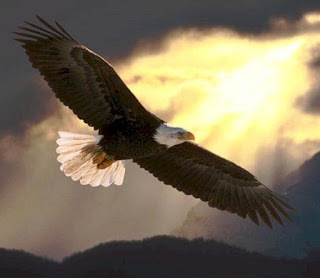 Seeing the eagle, the shepherd said to the farmer, "What a shame to keep that bird hobbled here in your barnyard! Why don't you let it go?" The farmer agreed, so they cut off the restraint. But the eagle continued to wander around, scratching and pecking as before. The shepherd picked it up and set it on a high stone wall. For the first time in months, the eagle saw the grand expanse of blue sky and the glowing sun. Then it spread its wings and with a leap soared off into a tremendous spiral flight, up and up and up. At last it was acting like an eagle again. On this February 29 2016, Leap Day will you like the eagle take the leap to become what God has for you to be? Dear Lord, give us the courage and strength to take the leap to become what You have designed for each one of us. Help us not to just sit back. In the Name of Jesus, Amen. Sometimes the struggle is exactly what we need. What would He want me to do? Rich are those who care for one another! Millions don't promise happiness but God does.